Small in size, big in flavor. Meatloaf may not be the most glamorous dish, but it is a classic comfort food that we all crave from time to time. These mini loafs are so much better when wrapped in Bacon. Preheat the oven to . Line a baking sheet with parchment paper. In a medium sauté pan, heat the oil over medium heat. Add the onion and sauté until tender, 4 to 5 minutes. Add the garlic and sauté until fragrant, 1 minute more. Transfer the mixture to a medium bowl and let cool about 5 minutes. Add the Worcestershire, ketchup, vinegar, mustard, paprika, cumin, salt, pepper and egg to the bowl with the onion and mix to combine. Add the meat and mix to combine fully. Add the bread crumbs and mix to combine. Divide the mixture into four even portions and then form into miniature loaves on the prepared baking sheet. Each loaf should be about long and 1½ to wide. Wrap each loaf with 3 pieces of the halved bacon. 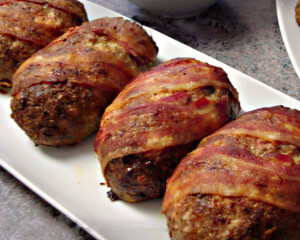 Bake the meatloaves until the bacon is well browned, and they are cooked through, 20 to 25 minutes. Cool slightly before serving warm. If you have mini loaf pans, you can use them in step 5 instead of forming the loaves on the baking sheet. In step 6, just lay the bacon strips on top of the loaves in the pans.